The highly innovative Ezee Applicator is one of those products you simply cannot do without. 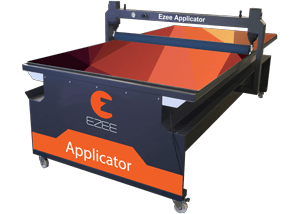 A sturdy and robust design makes the Ezee Applicator an Ezee choice for limiting time wastage, so that you can avoid the tedious task of spending hours applying media to a variety of substrates. You no longer need extra hands to assist aligning the media. Nor do you need to risk damaging the project while applying, leading to costly re-prints or re-cutting. Countless hours of frustration & time wasted are a thing of the past with our Ezee Applicator Series. Dry applications are here to stay with no mess & no fuss. There is a size to suit your exact requirements. All the models, excluding the EZA0, are backlit, to make sure you can easily weed fine-detail prints. All of your application projects may now easily be manned by one person. The adjustable, pneumatically powered gantry controls make all lamination & application projects a breeze. There are 3 sizes available for you to choose from: EZA0 (1200x860mm), EZ2600 (2600x1400mm) and EZ3200 (3200x1600mm). Ezee Lam 1600 is an entry level fully automated roll-to-roll warm assist lamination model with ABS tooling side-cover construction. It’s software provides securely aligned lamination and a quality finish. This model is ideal for wide format laminating and mount application usage.